This week, as I nurse wrists that are strained from time spent typing up 50+ pages of audio-recorded research notes, I am grateful for one very pivotal thing. I am glad that I don’t own a cat. Cat lovers everywhere have just sucked in an excessive amount of air, and are choking out their vigorous disagreement and shock at this statement. Not own a cat? But these small, fuzzy creatures provide hours of love, warm cuddly affection, and entertainment! (As illustrated daily on the internet funnies). It is blasphemy to suggest that anyone go through life without a feline companion. My counter-argument is below in “Exhibit A”. 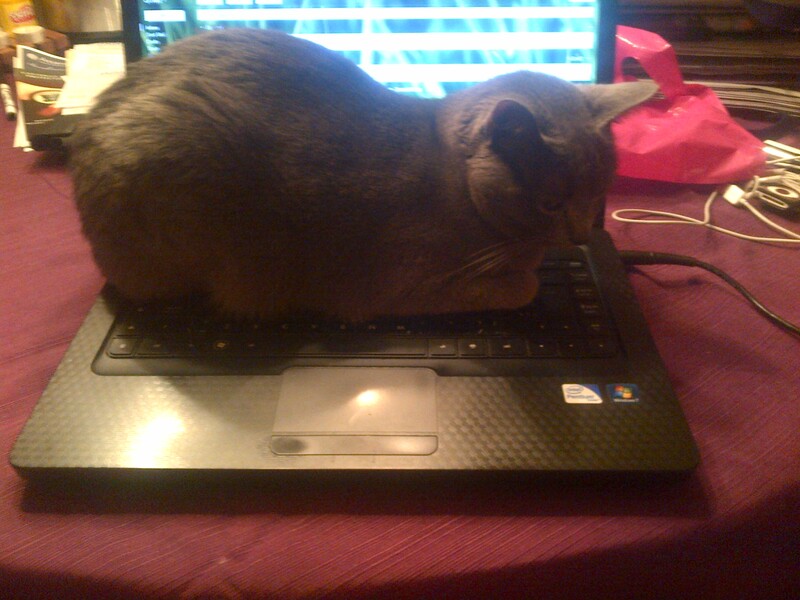 This cat clearly disregards my need to get work done effectively. In fact, the smug look on her face suggests that she is pleased to hear my huffs of aggravation over having my work become a source of warmth for kitty paws. I think very highly of other people’s pets. In fact, I spend a lot of time with them. In my own private abode, however, I’m glad to have a carpet that is free from creatures that I might accidentally step on, trip over, or unknowingly boot. I’m happy to leave the apartment everyday with nary a backwards glance, never having to worry that my pet languishes for my love, or that an intruder might harm the living creature I have secured as my own. What are the environmental impacts of having pets? Certainly, the economic investment of tiny dog jackets, gourmet cat food, and pet boarding seems a lively arena for business these days. Studies claim that people feel healthier and happier when they own a pet – providing a reason for our lengthy association with domesticated animals. Children, in particular, seem to enjoy the ownership of a creature smaller than themselves. I provide a second counter-argument to cat ownership in “Exhibit B”. This cat has possessed a significant amount of sofa space. The human fears for his food, as cat hair tends to get everywhere, and must eat it quickly. This eliminates both the pleasure of sitting and the act of eating. 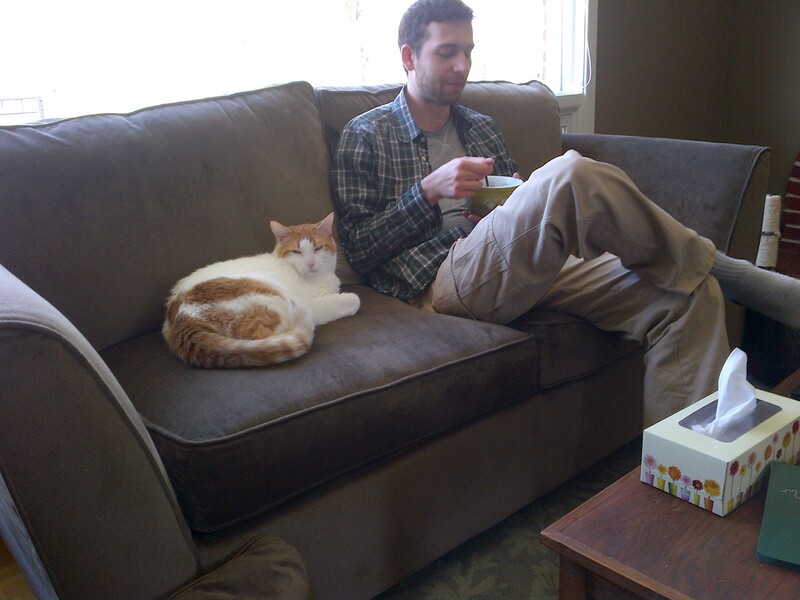 Again, this cat knows he has dominance on the sofa and appears coolly self-assured. Who wants a tiny Napoleon ruling their household? Why worry about having to scoop, clean, and maintain kitty litter? Do you enjoy picking up vomited-up hairballs? When it comes to pets (as with children), I think the effort is not worth the time, money, and anxiety invested*. *These words are officially recorded. However, the first time I find a tiny kitten or some other helpless creature lost on the side of the road, I will probably adopt it out of the goodness of my heart.